Bo Sanchez Truly Rich Club will hold Wealth Summit 2013- Wanted: SUPERHEROES OF ABUNDANCE on March 1-2, 2013 plus a BONUS day on March 3 at the Philippine International Convention Center (PICC) Manila. The Wealth Summit 2013 will help participants discover their hidden superpowers to create wealth for their family, church and the world. Bo Sanchez said that he is now a millionaire missionary. As such, he was able to give jobs to people and to finance his various ministries. To help participants transform their financial lives and be Superheroes of Abundance, speakers for the Wealth Summit 2013 would include members of Bo Sanchez' Truly Rich Club. Beauty Queen and celebrity Miriam Quiambao will also share her simple winning habits in her financial journey. Are you terrified that this may be your lot in life? Do you feel STUCK—that nothing seems to be happening in your financial life? Do you feel trapped to a small income? Do you feel like you’re never going to be rich—ever? Do you sometimes daydream that you’ll become so rich, you can help your family members and give large amounts of money to charity and ministry? But when you get back to reality, you don’t know how to make your daydream come true? Believe me, I know the feeling. Once upon a time, I was a poor missionary. I was so poor, there were days I couldn’t even get a haircut, or eat a burger, or even ride the bus. For 20 years, I lived with a few pesos in my pocket. Yes, I was happy serving God, but there were days when I wished I had a little extra so I could give more, help more, share more. I loved the poor. For years, I lived with them. To minister to them, I lived in a squalid slum area; and for 3 long years, I lived in the boondocks that had no water or electricity, so I could live with orphans and abandoned elderly people. I really thought that to love the poor, I had to BE poor. But as I look back, subconsciously, it was almost like I wanted them to REMAIN poor. (I never realized this before. Just in hindsight.) Proof: I distanced myself from learning about money, learning about business, or learning about investments… I felt ALL of that was of the devil. But every so often, I had dramatic, pivotal moments that would rock my world. That shook me to my very core. What Are You Painting On Your Life’s Canvass? I didn’t know what that meant. But as the years went by, I slowly understood. And the insight liberated me! For all my life, I realized I chose poverty. Because I thought that was what God wanted me to choose. That He wanted me to be poor. And I realized that I could, if I wanted to, at that moment, choose abundance. It was an amazing discovery. Slowly, I exorcised the perverted beliefs I had about money. I had to ALLOW God to prosper me so that I could prosper others. Abundance, by its very nature, is NOT about you. It’s about others. (It’s supposed to be about others.) It’s about serving others with the Wealth that God will give you. So is it time for you to transform your financial life today? I didn’t say improve. I said transform. How will this transformation happen? The doorway to abundance is specialized wisdom. I want to help you gain it today. Join me at the first ever TrulyRichClub WEALTH SUMMIT 2013—Wanted: Superheroes of Abundance. Here’s my VERY BIG question to you… Are you willing to be a Superhero of Abundance to your family? To the Church? To the world? This guy is what I call a Superhero of Abundance. He knows he doesn’t own his wealth. He knows God lent him His wealth for His purpose. What if there were a lot more Catholics like him who really worked at becoming rich and gave more to God’s work? This is now my crusade. I’m inviting you to make it your crusade as well. I’ve become a Superhero of Abundance too. But here’s my biggest reward: Because I know how to make money, I’ve been able to GUIDE thousands of people grow their wealth, something I could never do before. Thank God I made the switch. Because I transformed my financial life, I was able to pass on this wisdom to my TrulyRichClub Members—and THOUSANDS will retire multimillionaires. I ask you: Be a Superhero of Abundance! Make the switch. Transform your financial life. So that you too can guide others to make the switch. How? Come to the TrulyRichClub WEALTH SUMMIT 2013. It will be an unforgettable experience. The WEALTH SUMMIT will be on March 1 and 2, and a BONUS DAY on March 3. You’ll be taught by 11 TrulyRichClub Speakers. You’ll also hear our Celebrity Guest Miriam Quiambao share her exciting financial journey. You’ll hear her trials, her challenges, and her successes. Explode The Invisible Financial Ceiling Over Your Head. Learn the Habits of the Happy Millionaire! “Captain Abundance” Bo Sanchez (Founder, TrulyRichClub) will defeat financial mediocrity in your life by helping you create patterns of financial success that all multimillionaires practice. Start a financial revolution in your life! Eradicate LACK (Never depend on your company’s salary and retirement package alone!). Learn how you can create your MULTIMILLIONS by growing your money in the Stock Market; “Captain Abundance” Bo Sanchez (Founder, TrulyRichClub) and“Millionaire Maker” Edward Lee (Founder and Chairman of the Board, COLFinancial)will teach you how you can make it your SAFEST investment in the world. Gain Simple Habits of Abundance. Be inspired by TV and Movie Actress and former Beauty Queen “WealthWoman” Miriam Quiambao who will share her exciting financial journey; Learn from her the simple winning habits and attitudes that made her abundant and how you can apply the same simple habits yourself! You’ll be blessed listening to her. First things first—Remove all debt. Learn the liberating lifestyle that will get you to Zero-Debt in the quickest time possible. Learn the winning strategies of Financial Abundance from one of the most dynamic financial speakers in the country today, “Money Multiplier” Rex Mendoza (CEO and President, Philam). Take your career to the next level. Move forward in your company. Get promoted.Perform your best! Learn from THE pioneer of the Call Center and BPO industry of the country, “PioneerMan” Benedict Hernandez (President, Accenture) and“Poverty Executioner” Jon Escoto (President, LeadLife, Feast Builder, Light of Jesus). Convert Houses into Cash Cows. Find out how you can create passive income by buying foreclosed properties and turning them into money machines. “Doctor Rich”Larry Gamboa, Ph.D. (Bestselling Author, Think Rich Pinoy) and “Megabucks Man”Randy Manaloto (Founder and President, CityDorms Corp) will share the simplesystems they use to make money in real estate. Turn your computer into an ATM. Find out how you can earn MONEY through anviable internet business; “Money Magneto” Jomar Hilario (Internet Marketing Guru) and “Doctor Rich” Larry Gamboa, Ph.d (Author, Think Rich Pinoy) will teach youhow you can become a highly-paid infropreneur. Earn Dollars While Working from Home. Learn how to become a dollar-earningVirtual Assistant. “Money Magneto” Jomar Hilario (Internet Marketing Guru) will share how you can do this and the steps necessary to make this dream job happen. Start your own money-making business. Absorb the Entrepreneur’s mindset needed for you to launch your very own profitable enterprise. Learn from thedistinguished Asian Institute of Management Professor who runs 8 successful businesses, “Professor $” Dean Pax Lapid. (He starts one business a year. )Teaching with him is another serial entrepreneur, “Magic Man” Ronnie Siasoyco(Founder, Trion—the biggest producer of electric meters in the country today). Enjoy And Have Super Fun. This isn’t your staid, melancholic, boring conference inside a room. You’ll have so much fun with this exciting speakers and exciting crowd! It will be out of this world; You’ve got to experience it to FEEL it. Receive an Anointing for Abundance. “Captain Abundance” himself, Bo Sanchez,will lead you into a special prayer for God’s abundance to flow into your life. So that you can be a channel of God’s abundance to this hungry world. NOTE: More Special Surprise “Superheroes of Abundance” will appear during theTrulyRichClub WEALTH SUMMIT 2013! Real businesses will be showcased as examples for YOU to follow and imitate. You’ll find other sightings of Superheroes of Abundance walking around the WEALTH SUMMIT, dishing out magic advice and nuggets of wisdom: “Bridge Builder” Junie Torreja, “Doctor Wallet” Joen de las Penas, “Wealth Maker” Noel Arrandilla, , “Titan Tither” Rolly and Donna Espana, “Debt Destroyer” Fely and Benj Santiago, “Prosperity Man” Lyndon Malanog, and “Super Genius” Paolo Abadesco. You will also see Titanium InnerCircle Members and Platinum WealthCircleMembers who will be mingling in the crowd. All of them Superheroes of Abundance; Most will be disguising their secret identity. In between sessions, grab them, pick their brains, network with them, and get infected by their passion and energy. How Much Will The WEALTH SUMMIT Cost? Obviously, you know that an event of this magnitude—with this massive input—won’t be too cheap. 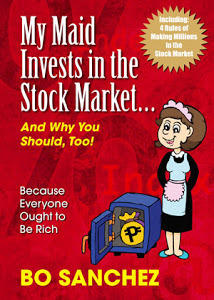 This 2-Day WEALTH SUMMIT will be held on March 1 and 2 is P19,975. However, because we’re doing this for the very first time, we’re offering it to you at a discounted rate of P14,975 only until January 31, 2012. (You save P9,000.00!) This is a HUGE STEAL when you think of the incredible wealth of wisdom you’ll receive in this event. But wait. Here’s an even BETTER NEWS: If you’re one of the next 100 people to register, you get your entrance ticket at a SPECIAL EARLY BIRD PRICE of P10,975 ONLYOR Two Monthly Payments of P5975 ONLY for the two-day WEALTH SUMMIT 2013. This is an unbelievable “insane” price that you should take advantage of. Do you want to be a Highly Paid Wisdom-Giver? Successful Speaker, Seminar Leader, and Coach? If you want to join the small group who will attend the BONUS DAY on March 3, Bo Sanchez will discuss How To Become A Highly Paid Wisdom Giver. If you want to become a Bestselling Author, Successful Speaker, Seminar Leader, and Coach, this day is especially designed especially for you. Your learning investment for the BONUS DAY is an additional P3975 ONLY.